Coincidentally, the image was published just before educators and students were to launch next week's Black Lives Matter at School initiative, a series of events focused on racial justice. A controversial illustration on the cover of a high-school newspaper has ignited a discussion about how Seattle can do a better job of teaching about race and equity in its public schools, many of which are segregated by race and taught mostly by white teachers. Monday, Feb. 4, 7-8:30 p.m.
Wednesday, Feb. 6, 4:45-6:30 p.m.
Friday, Feb. 8, 6-8 p.m. The illustration accompanied two stories in the newspaper: one on how substance abuse contributes to homelessness, and the other on how drug rehabilitation works and how much it costs. Neither story mentioned the intersection of race and homelessness, but for some, the illustration relied on stereotypes of black individuals as scapegoats in drug abuse and addiction. A photo of the illustration spread rapidly among students and parents at other schools on social media, and it prompted the principal to apologize, plan continued diversity training for staff and audit the newspaper’s workflow. 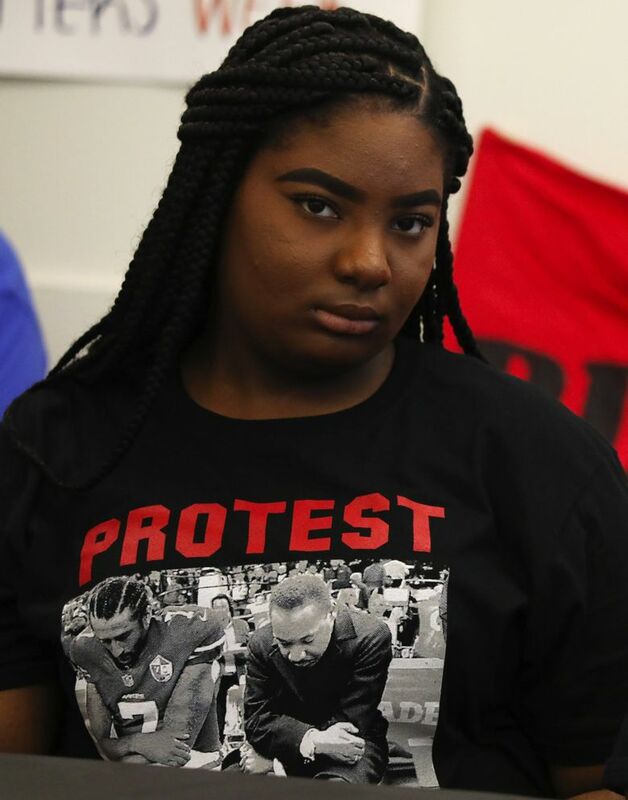 Coincidentally, the image was published just before local educators and students were to launch next week’s Black Lives Matter at School, a series of events focused on racial justice. For some, the Roosevelt episode called attention to the need for better lessons on ethnic studies — and gave added energy to coalition members’ hopes for the week. Next week, teachers involved in the movement plan to teach lessons on institutional racism and black history throughout the district. The National Education Association, Seattle Education Association and Seattle Parent Teacher Association have endorsed the week of action, and educators in cities across the country will also participate. Burr said her organization discussed racism and the newspaper’s illustration during a monthly meeting Monday with Superintendent Denise Juneau. Burr highlighted the controversy at Roosevelt High as an example of why Juneau and the district should expand ethnic studies to every school in Seattle. Racism — like sexism, homophobia and other types of prejudice that create inequality — “is something that students need to be given the skills to unpack in class every day, in all different types of ways,” said University of Washington professor Ralina Joseph in an email. Joseph is the director of the UW’s Center for Communication, Difference, and Equity. “The student who made this illustration might very well not harbor any racial animus, but his drawing, which is clearly racist (I don’t think there’s any disputing that) does show how easy it is to spew the racist stereotypes that live deep within all of us … not because we’re ‘bad’ people, but because we live in a society that is racist,” she said. The Seattle Times is not running an image of the cartoon because of its racist depiction. Tracy Castro-Gill, the Puget Sound regional teacher of the year and manager of the district’s nascent ethnic studies program, also suggested the Roosevelt student isn’t to blame. “The student is the product of the system, the racist system (in which) they’ve been taught,” Castro-Gill said. The Black Lives Matter at School coalition wants the schools to hire more black teachers, mandate black history and ethnic studies, and fund more counselors instead of police at schools. Students will rally outside of the Seattle Public Schools Board meeting next week, calling for these demands. Castro-Gill hopes schools will adopt an introductory ethnic studies curriculum approved by the school board in October. Many school administrators haven’t seemed to embrace the curriculum, she said, because they think their schools already promote diversity and don’t realize the problems are systemic. On Facebook, a man who identified himself as the father of the student who drew the illustration said his son raised concerns before publication about whether the image was appropriate, but those concerns were dismissed. The newspaper’s faculty adviser did not respond to requests for comment. Roosevelt, in north Seattle’s Ravenna neighborhood, is one of the least diverse high schools in the Seattle district. About 69 percent of its enrollment is white, and 4 percent is African-American, compared to the district average of 47 percent white and 15 percent African-American. The school, the principal wrote in her message, plans to have all staff participate in continued training on bias and stereotype awareness; audit the student newspaper review protocols and tighten internal controls, especially around racial issues; and work with the school’s Black Student Union and other cultural clubs to create a plan for reconciliation and healing. 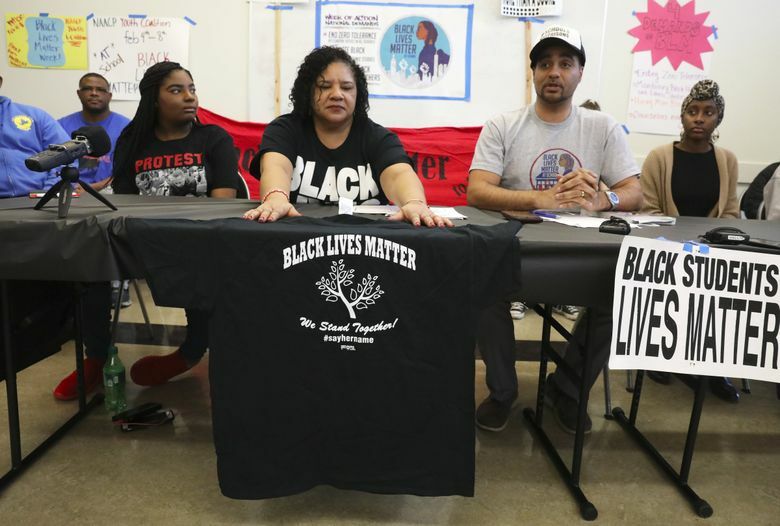 As the students grappled with the image, Seattle educators, students with the NAACP Youth Coalition, district staff and community advocates outlined their plans for Black Lives Matter at School week at a news conference. Jesse Hagopian, ethnic studies teacher at Garfield High, noted an important demand of the national Black Lives Matter at School coalition: Ending zero-tolerance policies that result in disproportionately high discipline rates for black students, especially females. 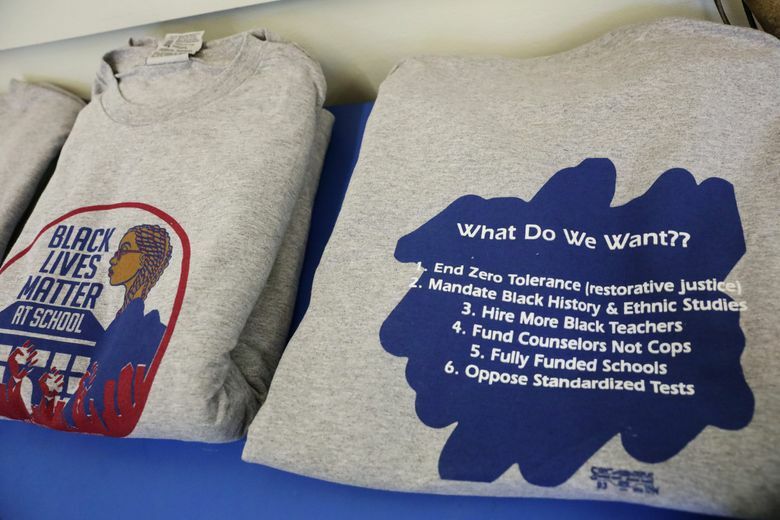 The coalition wants schools to replace those policies with restorative justice, a practice that encourages conflict resolution and peace circles between students and adults in schools. 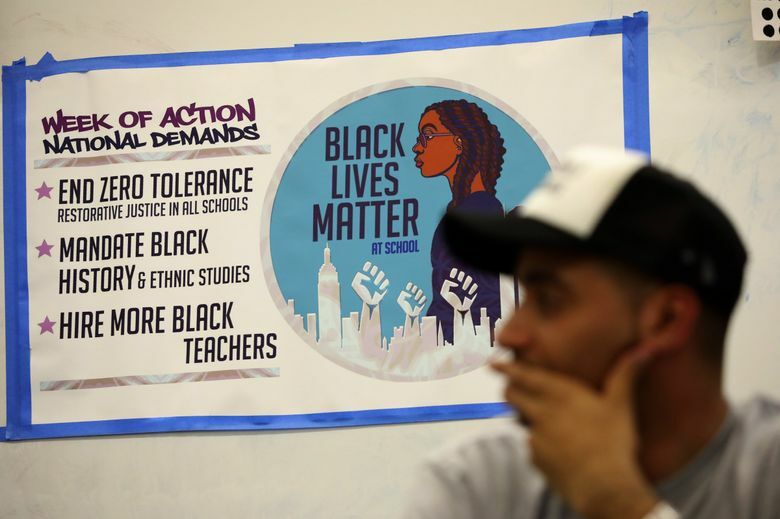 The Black Lives Matters in School movement has its roots in Seattle. In 2016, an event at John Muir Elementary in which teachers planned to wear Black Lives Matter shirts was canceled because of a security threat. In response, about 2,000 teachers here wore the shirts and some schools held rallies a month later. Teachers planning to participate in next week’s event also plan to wear Black Lives Matter at School T-shirts. In January 2017, a group of educators in Philadelphia inspired by what had transpired in Seattle organized a week of events based on the principles of the Black Lives Matter movement. Educators in multiple cities including Seattle then planned a nationwide Black Lives Matter at Schools week. At the news conference, some panel members said they felt the push to address racism in schools has mostly been a grass-roots effort. Israel Presley, a senior at Rainier Beach, said he thinks the Seattle school board has been trying but needs to do more to support students of color. Hagopian listed a number of high-profile cases of racism in schools nationally, including the case in which a New Jersey high-school wrestler was told by a referee he had to cut his dreadlocks to compete. The students who spoke at Monday’s news conference said what they experienced was more subtle, but still harmful. Many said what they wanted most was for teachers and administrators to listen to and invest in them. Rena Mateja Walker Burr, a freshman at Cleveland High School, said she wants her teachers to check in with her and see how she’s doing. If she has a disagreement with another student, she’d like for her teachers to hear both sides of the story. Aminah Adams, a senior at Rainier Beach, said students care more about school when they feel school staff care about them. She said she’d like school employees to ask about her goals and how they can help her meet them.